... and romantic flowers applied, carved or embroidered on transparent tulle. Rope is king, whether in the classical ankle tie espadrilles or as a base for lightweight leather lace-ups. Even more, carved cork for innovative uppers, such as boucle fabric plaited inserts or ripped faded jeans fabric for new, easy-chic sliders and slippers. Ribbons have pride of place on all kind of models, such as three-dimensional gardenias applied to the sides of the shoe, from sandals and sneakers to ballerinas. As for the colors, the palette is bright and natural, dominated by pink, beige, dove and clear blue; warmer and strong earth tones match black and leather. If the total-white or total-black look with contrasting stitching is timeless, the '50s style gingham check, red or blue, is new. 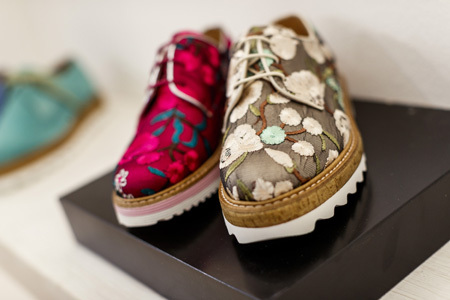 The shapes are easy, very flat with rubber or rope wedges, decorated slip-on and tennis sneakers, flip-flops embellished with glittering stones and dandy buckle slippers with ruffles, fringes and raffia flowers.